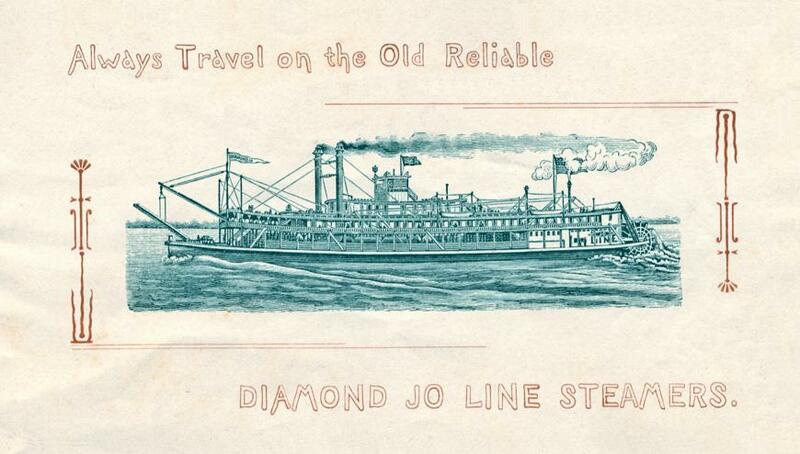 A favorite photo of the ARKANSAS when she was a proud member of the Diamond Jo line between 1871 and 1878. 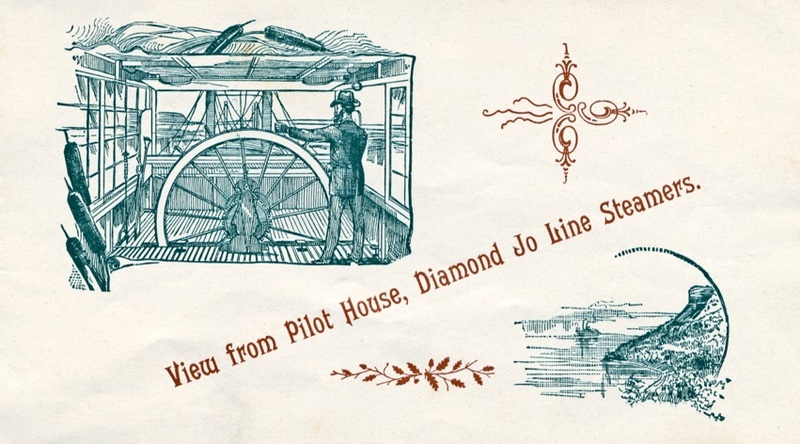 The prominent company logo is featured on the pilot house in this image in the La Crosse collection. This page features illustrations and documents associated with this company. Captain A. H. Shaw principal owner. Part of Mountain (St. Louis-Fort Benton) trade, but didn't complete to Fort Benton in 1869. Arrived at New Orleans on December 29, 1870 with 2,301 bales, the biggest cotton load out of the Arkansas River to that date; spring 1871 brought out 2,322 bales. These cotton trips extended up to Fort Smith, Arkansas. Ran on the Lower Mississippi until, on a trip to St. Louis, Missouri in August, 1871, she was sold to Captain "Diamond Jo" Reynolds for handling Upper Mississippi grain and packet cargoes. She was sunk near Dubuque in mid March 1876 and raised. 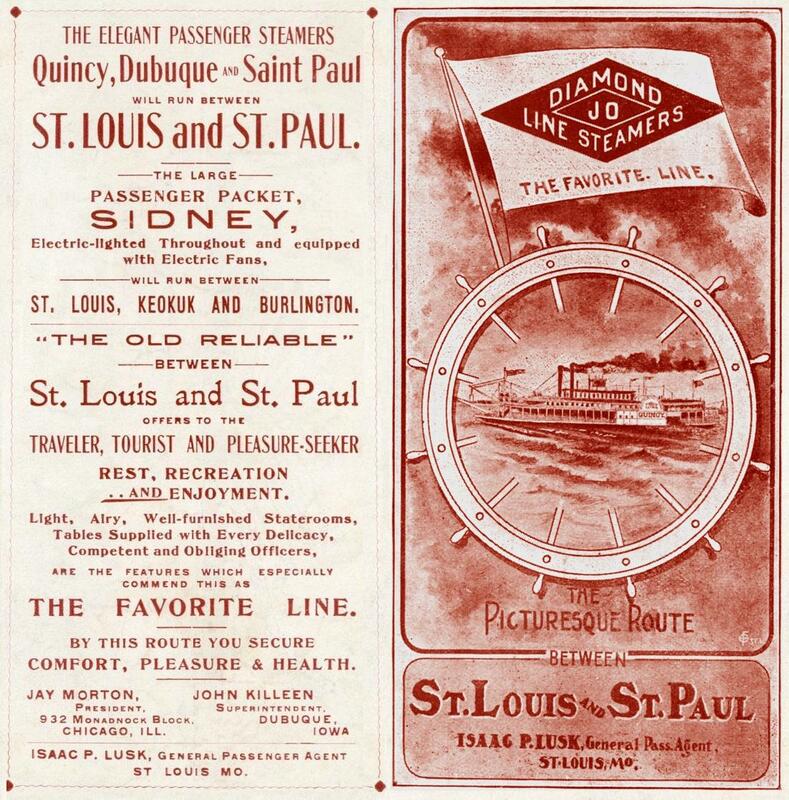 In 1878 she was sold to Captain Peyton "Pate" Davidson of La Crosse, Wisconsin. Homeport was La Crosse, Wisconsin in 1879. Captain Davidson used her several seasons in the Missouri and then on the Upper Mississippi. She was the first boat of the season to arrive at St. Louis from below, March 19, 1878. Sunk by ice, circa 1884, either at Louisiana, Missouri, or at St. Louis. 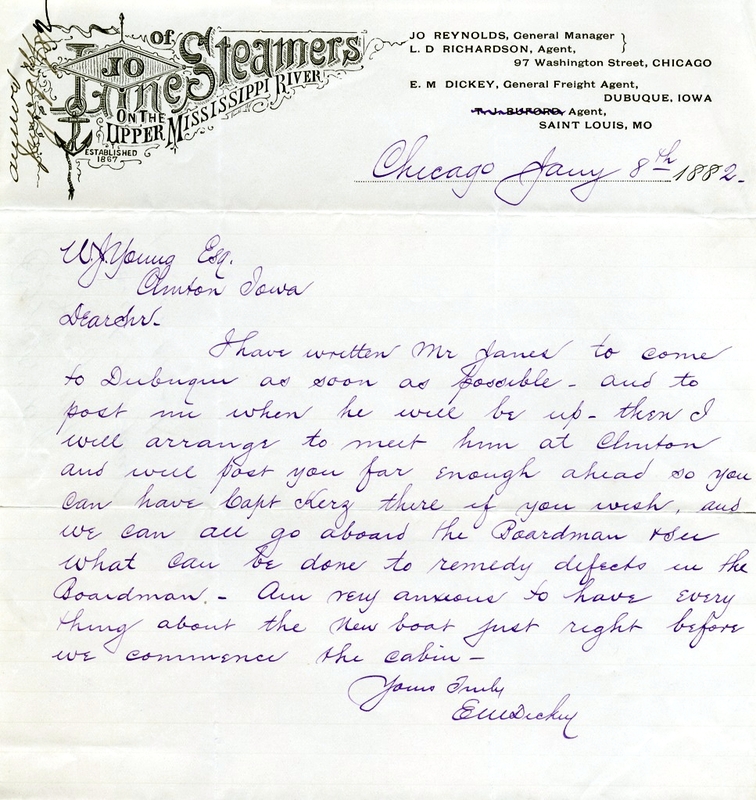 This 1882 letter from Diamond Jo General Freight Agent E M Dickey to W.J. Young of Clinton, Iowa seems to be referring to the building of a boat named "Boardman." No record of a boat named the Boardman has come to light as yet and it's possible that the name was changed before the boat was ever launched. The penmanship of E M Dickey is very easy to read but a transcript is provided below for even easier reading. The town of Boardman is in St. Croix County, Wisconsin. It was named for an early settler named C.A. Boardman in 1853. In 1870, Captain Kerz began rafting with the 'Sterling.' Two years later he sold the 'Sterling' to W.J. Young of Clinton and entered the employ of W.J. Young as commander of the 'Sterling' and afterwards of the 'J.W. Mills.' Later he superintended the building of the 'Douglas Boardman,' at the boat yards at Eagle Point and became its first commander. Afterward he superintended the building of the 'W.J. Young, Jr.' and became its commander in 1882 and was its commander at the time of his death, although he claimed that he was going to retire from the steamboat business that fall. He had been made commodore of the entire Young fleet and had absolute charge of the steamboat business of the W.J. Young and Company, and his recommendations governed all of the appointments of the officers of the fleet. He died quite suddenly at Galena, December 19, 1893, while walking home from town. If there ever was a man who really loved his work it was Captain Paul Kerz. I never knew any one else who worked so many hours and slept so few, and no one ever heard him complain of want of sleep or over-work. He was thoroughly loyal to his employers, to his family and his church, and he had the complete confidence of all who knew him. Captain Kerz demonstrated the truth of the old saying, "He succeeds best who is most wedded to his task." Interesting letterhead. Almost looks like a wood or linoleum carving with some rough edges. 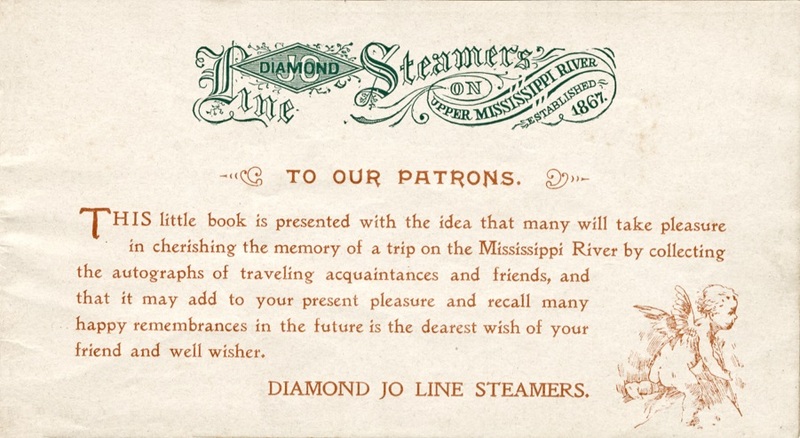 Attached scans of cover and 3 pages with graphics on them from a Diamond Jo Line Autograph album measuring 3 1/4 X 6 inches that was given to each passenger as a souvenir. 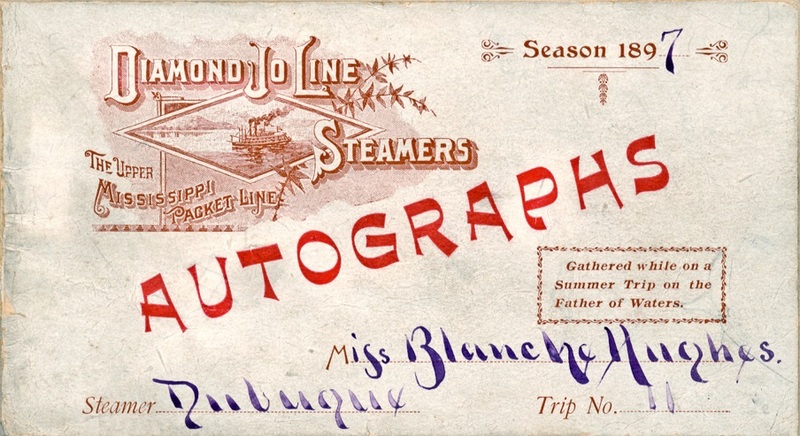 One of the boat's staff with fine calligraphic penmanship apparently filled in the names of the DUBUQUE, Miss Blanche Hughes, the 1897 Season and Trip No 11. In 1905 a book was published promoting Hannibal, Missouri's commerce, business men with a history dating back to before Sam Clemens and his family came to town. 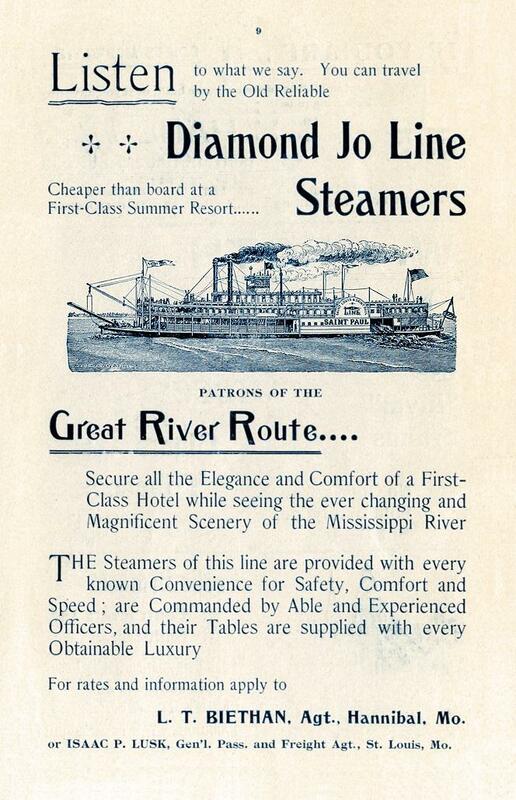 The Diamond Jo steamboat line bought page 9 as an advertising page for their company (attached). 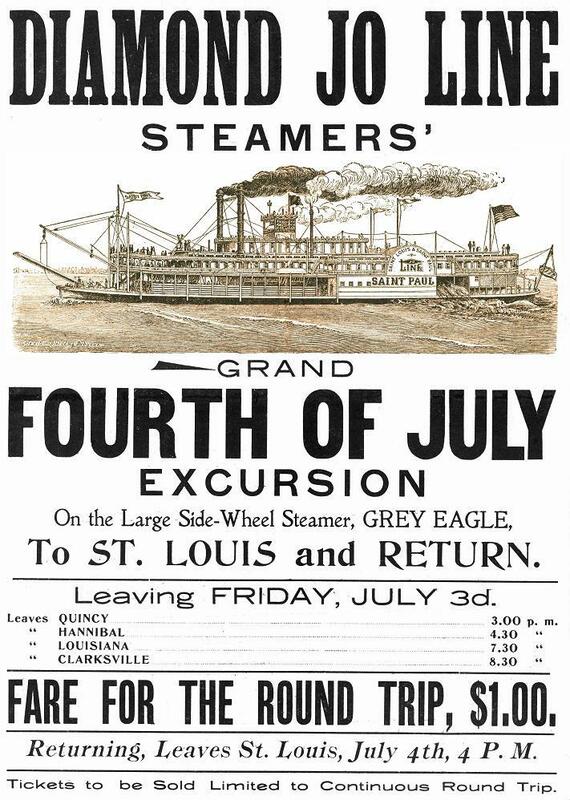 The steamboat GREY EAGLE began working in the St. Louis excursion trade in 1910 and was lost at Paducah, KY in 1918. Have deduced that the date for the attached Diamond Jo line broadside would have been in 1914 when July 3rd fell on a Friday. 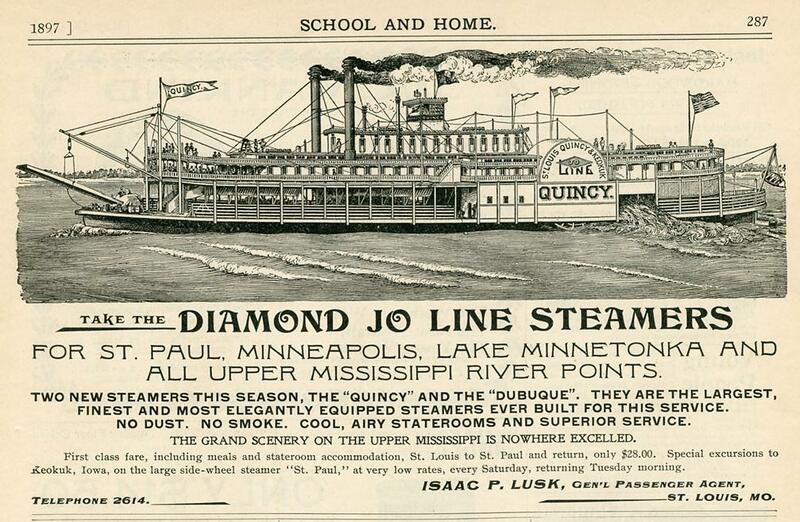 The steamboat vignette is of another Diamond Jo boat the SAINT PAUL. I bought this piece many years ago, one of the earliest in my collection. It measures 8.30 x 11.40 inches. The scheduled times for the boat to stop and pick up passengers are at rivertowns above and below HANNIBAL, MO on the Mississippi where Sam Clemens grew up. QUINCY, Illinois is up river from Hannibal and the Missouri towns of LOUISIANA and CLARKSVILLE are down river from Hannibal. The distance in miles from the Falls of St. Anthony to these rivertowns were listed in "Appleton's Guide" for 1852. 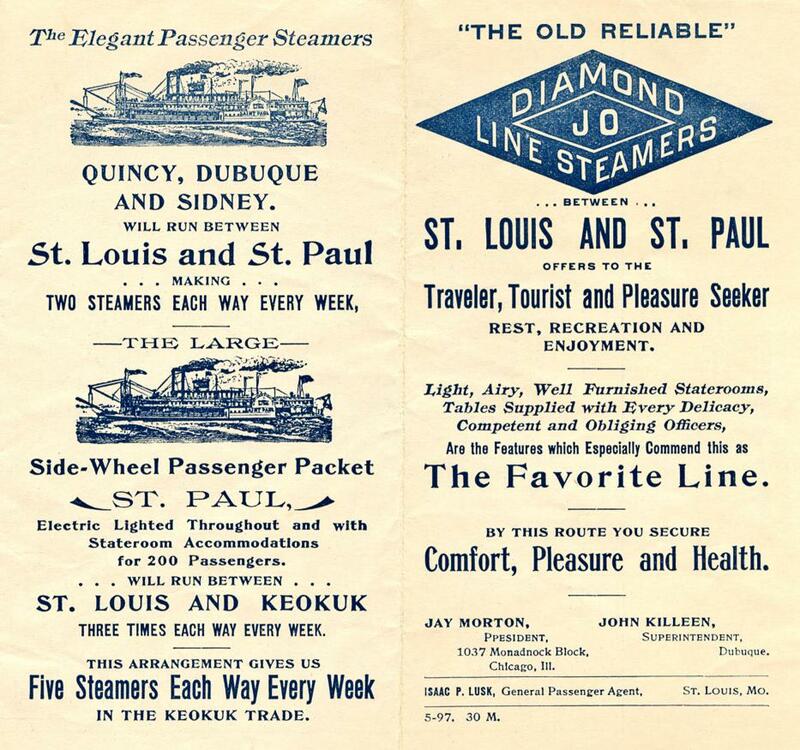 One quarter section 6 x 6 1/4 composing front and back cover from an 8 panel folded Diamond Jo line brochure measuring 11 3/4 x 12 1/2 unfolded, promoting their St. Louis - St. Paul passenger service provided by the steamers QUINCY, DUBUQUE and SAINT PAUL. 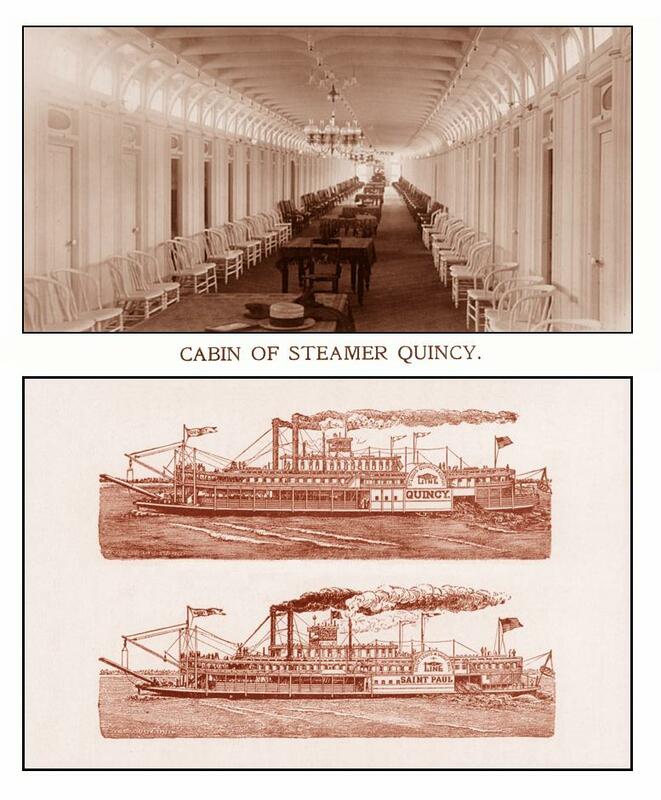 Also attached from the same brochure a modified and enhanced version of a photo of the QUINCY's cabin (in the original brochure the image is heavily screened so was able to replace it with a photo of the same cabin from La Crosse that matched it very closely) and below the cabin photo, engravings of both the QUINCY and the SAINT PAUL. See a couple more Diamond Jo documents in our waybill and documents collection - (at this site) click here.